For program specific information, Please go to menu in upper right. Monday, Tuesday, Thursday and Friday- 8:00 a.m. to 4:00 p.m.
Wednesdays 8:00 a.m. to 6:00 p.m. The Alpena County (Alpena) office remains open from 12:00 p.m.-1:00 p.m.
Offices located in Cheboygan County (Cheboygan), Montmorency County (Atlanta) and Presque Isle County (Rogers City) will close for lunch from 12:00 p.m. – 1:00 p.m.
District Health Department No. 4 is closed on the following Holidays: New Year’s Day, Martin Luther King Jr. Day, President’s Day, Good Friday, Memorial Day, 4th of July, Labor Day, Veteran’s Day, Thanksgiving Day & the day after, and Christmas Day. 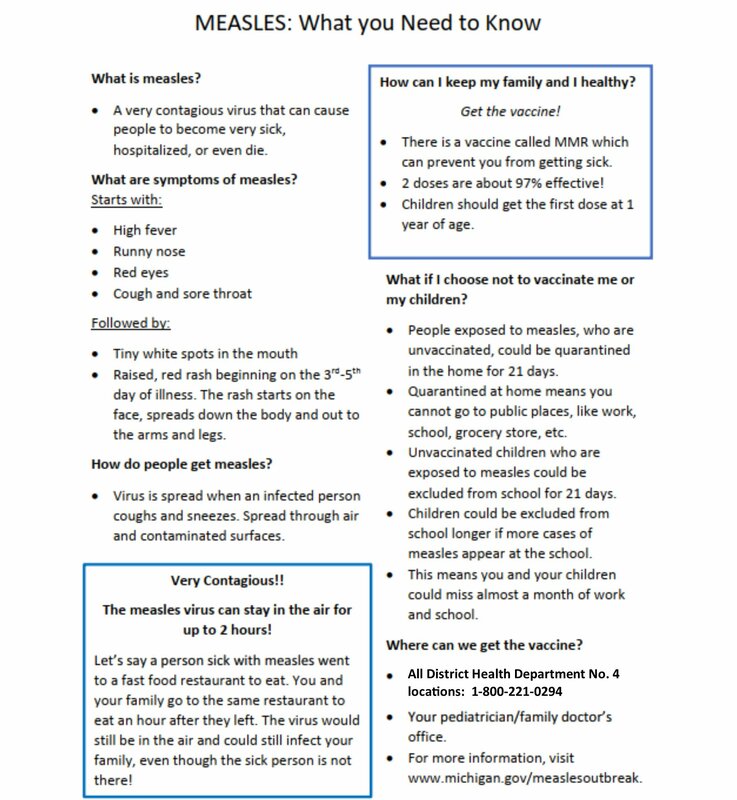 Currently the State of Michigan is experiencing a measles outbreak with 34 confirmed cases as of April 3, 2019 in Oakland and Wayne counties. The best protection against the measles is to be vaccinated. To make an appointment to be vaccinated, call your local provider or District Health Department No. 4 at 1-800-221-0294. For more information on the outbreak, visit www.michigan.gov/measlesoutbreak.